THE DESIGN: The one thing the couple knew was that they wanted to surround themselves with the people they loved on their big day. Once they stepped inside The Lodge at Fall City Farms, Herban Feast’s new Snoqualmie Valley venue, with its large stone fireplace and old-growth woodland surroundings, they were immediately struck by the smell of fresh-cut wood and leather, which transported them back to Molly’s family ranch in Montana, where they’d spent holidays among family. The couple was the first to marry at the new venue and they added to the site’s rustic feel with Kentucky mule signature cocktails served in copper mugs, a seating map scrawled out on an old window pane, and evocative Northwest touches, such as a lavender-scented cake and bouquets dotted with mint leaves and baby cotton. 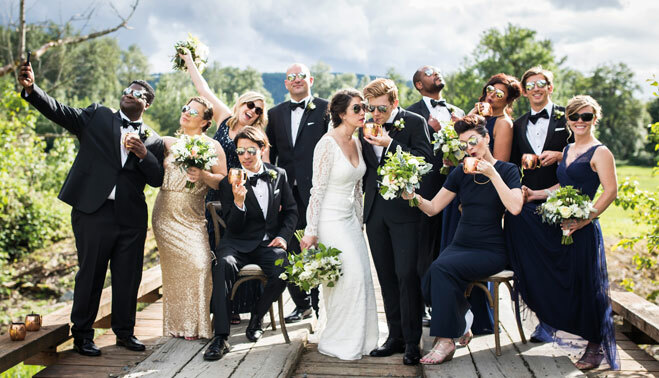 Matching reflective sunglasses bought on a whim by a groomsman added an element of fun to the couple’s wedding-day photos. able to feature her favorite wines from her uncle’s portfolio. TRADITIONS: When Dan’s family members gather for meals, they don’t bother with potluck style. Instead, everyone shows up, and it turns into a huge, collective cooking party. So in place of a wedding shower before the big day, the couple hosted a night at cooking school at Tom Douglas’ Hot Stove Society for a delicious party that brought everyone together in the kitchen.